Today’s kids spend less and less time outdoors, and it’s taking a toll on their health and well-being. Research has shown that children do better physically and emotionally when they are in green spaces, benefiting from the positive feelings, stress reduction, and attention restoration nature engenders. No one has brought attention to this issue more than Richard Louv, co-founder and chairman emeritus of the Children & Nature Network and author of Last Child in the Woods, The Nature Principle, and, most recently, Vitamin N: 500 Ways to Enrich the Health & Happiness of Your Family & Community. Louv has written eloquently about the importance of nature for children and what they miss by spending too much time indoors. His books have inspired many parents and educators to more thoughtfully incorporate outdoor experiences into children’s daily lives. Louv also warns about the consequences for the environment if we don’t raise children who truly have a personal relationship with nature. In our interview, he explains just how dire the problem is and how parents, educators, and urban planners can help kids reconnect with nature wherever they are. Jill Suttie: You’ve written that today’s kids have “nature-deficit disorder.” What does that mean, and why is it important? 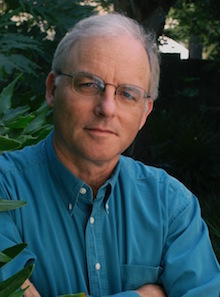 Richard Louv: “Nature-deficit disorder” is not a medical diagnosis, but a useful term—a metaphor—to describe what many of us believe are the human costs of alienation from nature: diminished use of the senses, attention difficulties, higher rates of physical and emotional illnesses, a rising rate of myopia, child and adult obesity, Vitamin D deficiency, and other maladies. Because researchers have turned to this topic relatively recently, most of the evidence is correlative, not causal. But it tends to point in one direction: Experiences in the natural world appear to offer great benefits to psychological and physical health and the ability to learn, for children and adults. The research strongly suggests that time in nature can help many children learn to build confidence in themselves, calm themselves, and focus. Studies also indicate that direct exposure to nature can relieve the symptoms of attention-deficit disorders. By comparison, activities indoors—such as watching TV—or activities outdoors in paved, non-green areas leave these children functioning worse. Today, children and adults who work and learn in a dominantly digital environment expend enormous energy blocking out many of the human senses in order to focus narrowly on the screen in front of the eyes. That’s the very definition of being less alive, and what parent wants his or her child to be less alive? JS: How will this trend impact pro-environmental attitudes and behaviors in kids? RL: If nature experiences continue to fade from the current generation of young people, and the next, and the ones to follow, where will future stewards of the earth come from? Past research has shown that adults who identify themselves as environmentalists or conservationists almost always had some transcendent experiences in the natural world. What happens if that personal experience virtually disappears? There will always be conservationists and environmentalists, but if we don’t turn this trend around, they’ll increasingly carry nature in their briefcases, not in their hearts. And that’s a very different relationship. JS: Are there particular kinds of experiences in nature that seem to have the most impact on kids? RL: The quality of the nature experience depends on how direct the experience with nature is. Are kids getting their hands wet and their feet muddy? These types of activities can help kids learn to have confidence in themselves and power to make independent decisions. One reason for this is the risk-taking inherent in outdoor play, which plays an important role in child development. Without independent play, the critical cognitive skill called executive function is at risk. Executive function is a complex process, but at its core is the ability to exert self-control, to control and direct emotion and behavior. Children develop executive function in large part through make-believe play. The function is aptly named: When you make up your own world, you’re the executive. 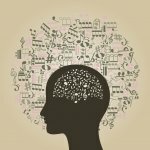 A child’s executive function, as it turns out, is a better predictor of success in school than IQ. JS: What can parents do to help increase caring for nature in their kids? RL: If children are given the opportunity to experience nature, even in simple ways, interaction and engagement follow quite naturally. But parents can sometimes push too hard. Nature time should never be seen by kids as a punishment for, say, spending too much time in the electronic world. Perhaps the best way to do this is by example. When parents rediscover their sense of wonder, so do most kids. Many parents tell me that the same kids who complained on the way to the camping trip often, when they’re young adults, recall that camping trip as one of their fondest memories—which (as you might guess) causes mixed emotions in the parents! One thing to keep in mind: People seldom look back on their childhoods and recall the best day they ever spent watching TV. JS: How can parents help kids care about nature when they live in urban environments without ready access to wild spaces? RL: Any green space will provide some benefit to mental and physical well-being. In urban areas, more natural landscapes can be found in a park, a quiet corner with a tree, several pots with vegetables growing outside, or even a peaceful place with a view of the sky and clouds. Connection to nature should be an everyday occurrence, and if we design our cities—including our homes, apartments, workplaces, and schools—to work in harmony with nature and biodiversity, this could become a commonplace pattern. Individually, we can help bring back the food chain and improve biodiversity by transitioning our yards or other properties to native species. Schools, workplaces, and city policymakers can do the same thing. We do know that the greater the biodiversity in an urban park, the greater the psychological benefits to people. Why not think of cities as incubators of biodiversity and engines of human health? JS: What can parents do if their kids are afraid of nature or if they themselves are disconnected from nature? RL: Many children and young adults simply don’t know what they’re missing. It’s never too early or too late to teach children or adults to appreciate and connect with the outdoors. Rachel Carson often said that a child’s positive connection to nature depends on two things: special places and special people. As parents and educators, we can spend more time with children in nature. We can go there with them. Taking time to do that can be quite a challenge. Getting kids outside needs to be a conscious act on the part of parents or caregivers. We need to schedule nature time. This proactive approach is simply part of today’s reality. 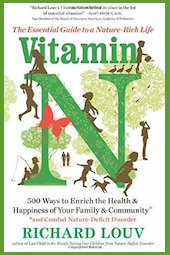 My new book, Vitamin N, includes 500 actions that people can take to enrich the health and happiness of their families and communities—and to help create a future that we’ll all want to go to. JS: What can schools do better to help kids develop an affinity for nature? RL: While many school districts in the U.S. are going in the opposite direction—toward less physical movement and more testing, more hours at desks or in the classroom—a counter trend is growing, toward school gardens, natural play areas, getting kids out of the classroom. We’re beginning to see the true greening of American education. In education, for every dollar we spend on the virtual, we should spend at least another dollar on the real, especially on creating more learning environments in natural settings. Ultimately, we need to accomplish deep cultural change. We need to incorporate nature education and knowledge of its positive benefits into the training that every teacher receives. We need to credit the many teachers who have insisted on exposing their students directly to nature, despite trends in the opposite direction. Teachers and schools can’t go it alone—parents, policymakers, and whole communities must pitch in. Recently, I visited a nature-based elementary school in a lower-income region of a county in Georgia. The school is showing more academic improvement than any other school in that county. The kids are generally healthier, as well. 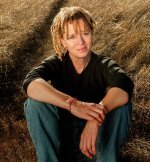 We need, and I believe we see already growing, a cultural movement– what I call a New Nature Movement—that includes but goes beyond great programs that directly connect kids to nature: a movement that includes but goes beyond traditional environmentalism and sustainability, a movement that can touch every part of society. The object is to give children the gifts of nature they deserve, and for all of us to find kinship with the lives around us, and wholeness in the lives we live. JS: What kinds of environmental education programs make the most difference in increasing a child’s connection to nature and their willingness to protect it? RL: Programs that infuse education with direct experience, especially in nature, have the greatest impact. For many, the natural environment has been intellectualized or removed. Young people certainly need to know about threats to the environment, but they also need direct experience in nature just for the joy of it. Unless we achieve that balance, many children will associate nature with fear and destruction for the rest of their lives. Too many students learn about climate change in windowless schools. While including environmental education in the curriculum, many school districts in the U.S. have banished live animals from classrooms, dropped outdoor playtime and field trips, and overloaded classrooms with computers. Connecting our children directly to nature is a way to both deal with the impact of loss of nature and to plant the seeds, sometimes literally, of a nature-rich future. JS: What are some more positive trends that you’ve observed? RL: We’re seeing new appreciation for these issues among parents, educators, pediatricians, mayors, and others. The National League of Cities (which represents 19,000 municipalities and 218 million Americans) and the Children & Nature Network announced a three-year partnership, the Cities Promoting Access to Nature initiative, to explore how municipalities can connect people with the natural world where they live, work, learn, and play. We also see the emergence of biophilic design of our homes and workplaces, reconciliation ecology and human-nature social capital, restorative homes and businesses, eco-psychology and other forms of nature therapy. We see more citizen naturalists, nature-based schools, the Slow Food and simplicity movements, organic gardening, urban agriculture, vanguard ranching, and other forms of the new agrarianism. As these currents join, they’ll lead us to a different view of the future—a nature-rich future. The barriers are still there, but I do believe there’s more hope in the air, if you look for it. This article is printed here with permission. It originally appeared on Greater Good, the online magazine of the Greater Good Science Center (GGSC). Based at UC Berkeley, the GGSC studies the psychology, sociology, and neuroscience of well-being, and teaches skills that foster a thriving, resilient, and compassionate society.